ADOPTED: I have found my forever home!! One that understands it is quality NOT quantity!! My new family understands the commitment needed and the love wanted and realizes that we all will die someday so enjoy every minute we are alive!! I love my new family!! My family of 6 years dumped me at the Franklin County Animal Shelter when I became ill and they said they could not afford to take me to their vet to get x-rays to find out what was wrong. Luckily the shelter called Harlequin Haven and they opened their hearts and home to me I was immediately picked up from the shelter and brought to the rescue. I have been at the rescue for a week now and am starting to feel a bit better but the vet says it will take months of antibiotics to be 100% well again. Needless to say I had not just became ill when I was dumped at the shelter. Grandma took me to the vet, I had x-rays, and was diagnosed with Intervertebral Intradiscal Osteomylitis also known as Discosponylitis in layman terms infection between the disc in my neck. I will require long term antibiotics but in 2 months I will be healthy again. Update December 1: Check out my new pictures below!!! It is amazing what changes have happened in just 3 weeks!!! I feel like a new dog, I am pain free and happy!! Update December 6: Grandma said I could give you all a quick update, I got a new baby to play with and it is not even Christmas yet!!! It is a stuffed squeak toy and I love it!!! Grandma said I act like a puppy, but she is wrong because puppies chew things up and I just LOVE playing with toys and not destroying them!! Okay time for me to go play again!! Update December 13: Grandma said I could give you a quick update! I continue to do wonderful and I keep talking Grandma into more babies!!! I have a new friend her name is Rylee she was really sick when she first came in so she was not so much fun but now that she has had her leg removed we have become really good friends!! One day soon if the weather cooperates we will play outside, we can't wait!! Well I hear my babies calling. Just so you know my babies are not real they are stuffed squeak toys, just didn't want you to get the wrong idea!! Update December 15: Yesterday Rylee and I went outside to play but was not able to play because of the recent rains, it was too muddy!! We started to go outside today to play but we both agreed to stay inside and play with our toys because today it was too cold!! Yes we are a bit spoiled already!! 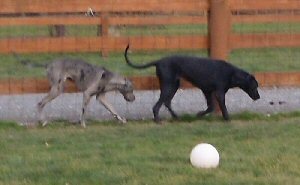 We did ask grandma to take a picture of us yesterday although we were just wandering around trying not to get our paws muddy! Update December 24: Well tomorrow is Christmas and although I already feel I have been given a lot since I came to the rescue I am hoping for a few more new toys!! Grandma says I have been really really good so I have my paws crossed!! I love toys!! 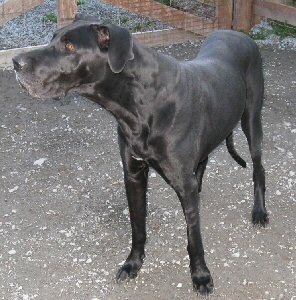 Grandma also told me that I will be ready for adoption at the first of the year! 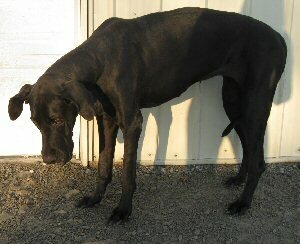 I hope I am a lucky dog and get a great forever home!! Update December 31: I am doing wonderful and am totally well!! Grandma says I can now start looking for a forever home! I love to play and act half my age, grandma says my only fault is I like to talk to much and some people don't understand she says I am a "Chatty Cathy", whatever that means!! I guess you have to be old to understand that! 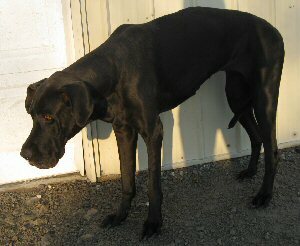 Updated March 13: I no longer am available for adoption and became a sanctuary Dane. I am in heart failure and have not responded to the medication. Updated January 28: I was taken off the adoption list almost 1 year ago and of course then I started responding to the medication. 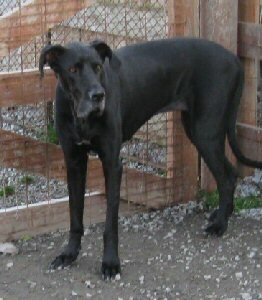 Well Grandma and I had a long talk and we decided I would stay a sanctuary dog because who would want to adopt an old Dane with a heart probem. Well today I was adopted!! Ya just never know do you?